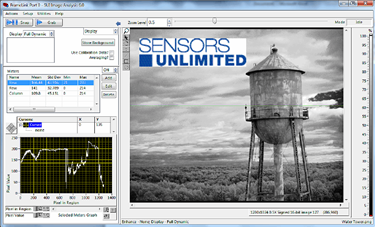 Sensors Unlimited’s Image Analysis Software is designed to provide single-scan, continuous, averaged, windowed, or triggered video image acquisition, while offering full camera control with an easy-to-use graphical interface. Storage and retrieval options include binary, bitmap, png, text, avi, or jpg file formats with a choice of scaling options and provisions for separate storage of background images. Specifically designed for SWIR imaging, this image analysis software is compatible with all Sensor Unlimited camera families including line scan, full-frame, and windowed area cameras. Additional options include image intensity scaling for auto-scaling to min-max, to 90% of max, fixed limits, or bit shifted, as well as image enhancement options, such as histogram equalization, to deliver increased contrast in all intensity ranges. Download the available datasheet for more features and options for the image analysis software.